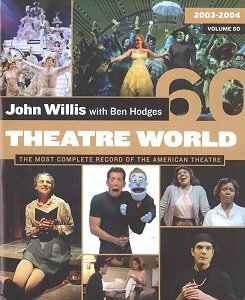 Applause Theatre & Cinema Books has just published the 60th edition of THEATRE WORLD, the bi-annual reference book that proudly and accurately calls itself The Most Complete Record of the American Theatre. Edited by John Willis (with Ben Hodges), the 2003-2004 compilation lists every Broadway, Off-Broadway and Off-Off Broadway show that was mounted in that time period, giving full cast and creative credits, time and place of run (with accompanying illustrations). The 377-page book also lists key professional regional company credits, winners of the various major theatre awards, plus lists of the longest-running shows in Broadway history (still sitting in the catbird seat is CATS, with 7,485 performances, followed by PHANTOM OF THE OPERA, LES MISERABLES, CHORUS LINE and OH! CALCUTTA!). A final sad note is struck with the Obituary section.